Prevention is the foundation of quality dental care, helping patients maintain the high level of oral health they deserve and enjoy a functional, beautiful smile for many years to come. Here in Asheville, our team can provide the routine maintenance and support you need, as well as treat potential problems at the earliest stages possible. Please contact us today if you have any questions we can help you with, or if you’re ready to schedule a check-up with Dr. John White. Our dental team takes the time to be as thorough as possible during your oral examinations, providing an in-depth visual review, periodontal charting and probing, the capturing of X-rays, and much more. Dr. White’s goal is to form a comprehensive understanding of each patient’s needs so that he can make treatment recommendations that are ideal for their situation and the results they hope to achieve. Dental cleanings are also an important part of routine visits because they allow our dedicated team members to remove dangerous bacteria from the mouth, ensuring a healthier smile that feels and looks wonderfully revitalized. Dr. White wants his valued patients from Fletcher, NC and surrounding areas to enjoy themselves to the fullest while playing their favorite sports. Sadly, this can’t be accomplished when the threat of oral damage and pain is lurking around in every instance of physical contact, whether it involves other players, hard surfaces, or projectiles. Thankfully, a customized sportsguard from our practice can provide the athletes in your family with plenty of quality protection and confidence. These appliances are designed to fit comfortably and allow for clear speech and unhindered movement so that the wearer’s focus can stay on the game. On average, oral cancer leads to the death of one person every hour. This condition is a serious one, and Dr. White and the rest of our staff here in Asheville, NC do not take it lightly. A person’s chances of successfully recovering from oral cancer are greatly increased when their case is diagnosed early on, which is why we’ve incorporated screenings as a vital part of every check-up. During this time, our team will carefully review your mouth for common signs of cancerous cells, including white and red patches, thickened or crusty areas in the soft tissue, and oral sores that aren’t healing properly. Fluoride is a valuable mineral when it comes to oral health; in fact, its presence in a person’s drinking water can lead to them developing stronger, healthier teeth overall that are more resistant to decay. If you aren’t receiving enough fluoride in your daily life, Dr. White may recommend an additional application during your routine check-ups and cleanings to bolster your smile’s vitality and aid in the remineralization process. Dr. White and the rest of our team will keep a close eye out for damage caused by gum disease during your routine appointments, and treatment options like in-depth cleanings and antibiotic therapy are available if needed to restore health to your smile. 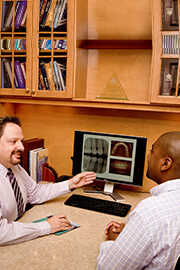 We use voice recognition technology to record periodontal charting and examinations for added convenience and accuracy.